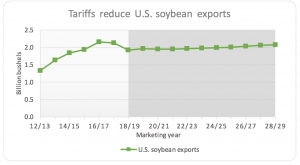 The release noted that, “FAPRI’s analysis shows that projected prices for U.S. soybeans and other products affected by current trade disputes remain below levels that would prevail if foreign tariffs were removed. 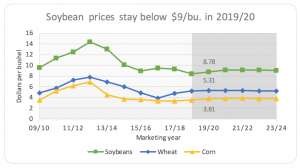 The projected average 2019-20 prices of soybean, corn and wheat do show slight increases from 2018-19, with soybeans at $8.78 per bushel, corn at $3.81 per bushel and wheat at $5.31 per bushel. 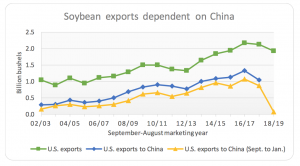 Further recovery in wheat prices could be limited by continued large global supplies, while cotton prices could fall in 2019-20 in response to increased U.S. production. 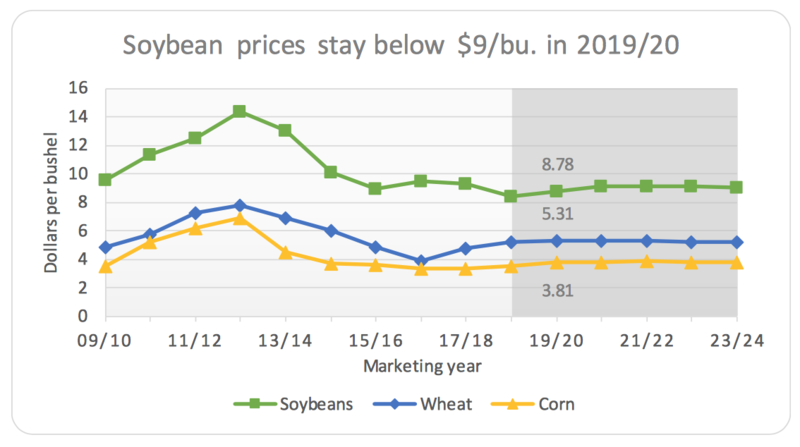 [FAPRI Director Patrick Westhoff] added that part of the reason crop prices are lower is due to recent growing conditions. 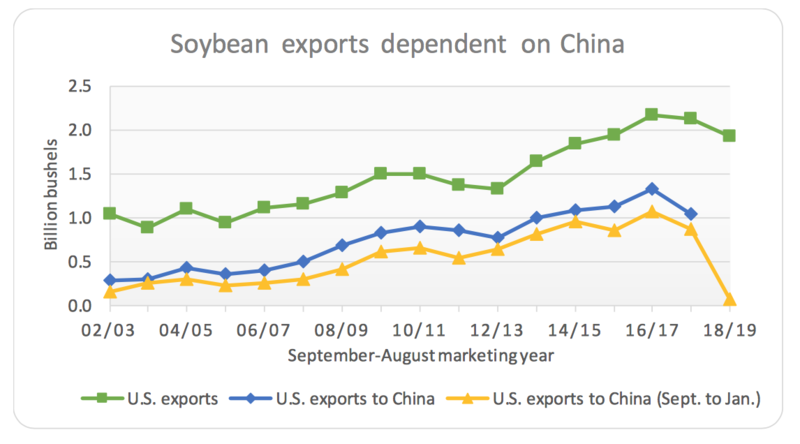 He said the past six years have featured relatively solid growing conditions worldwide, leading to large crop supplies. 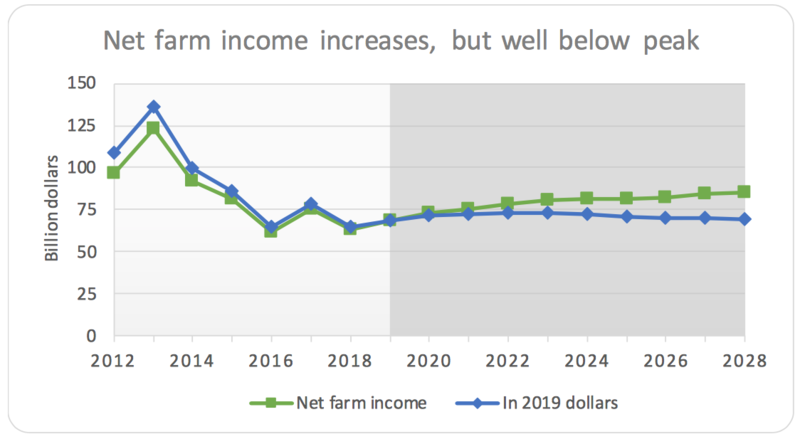 Before getting into additional details of the FAPRI report, recall that earlier this year USDA released its 2019 Farm Income forecast, as well as it’s 10-year projections; and USDA Chief Economist Robert C. Johansson provided a broad outlook for U.S. agriculture in late February. 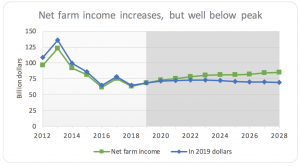 Also in February, the Federal Reserve Banks of Chicago, St. Louis, Kansas City and Minneapolis each released updates regarding farmland values and agricultural credit conditions from the fourth quarter of last year. U.S. Baseline Outlook. April 2019, FAPRI-MU Report #01-19. 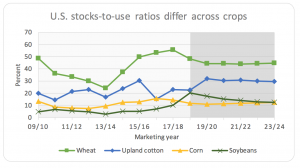 More narrowly on crop variables, the FAPRI update stated that, “The ratio of carryover stocks to an- nual use differs greatly across U.S. crops. 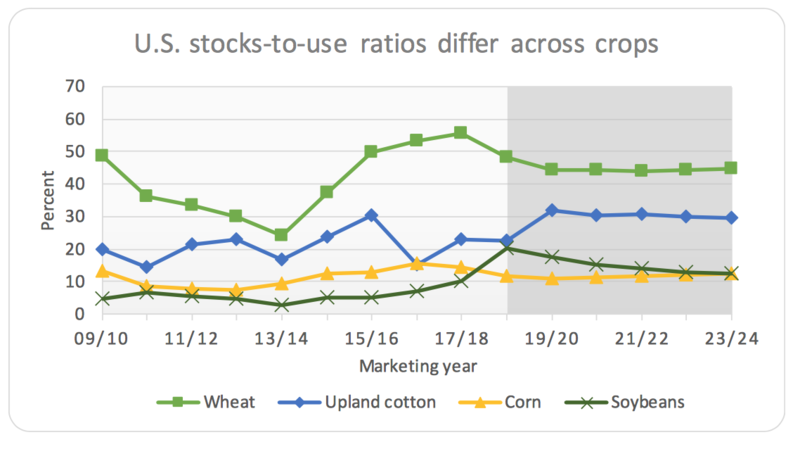 The projected ratios for both wheat and corn decline in 2018/19 and 2019/20, as use exceeds the sum of production and imports. 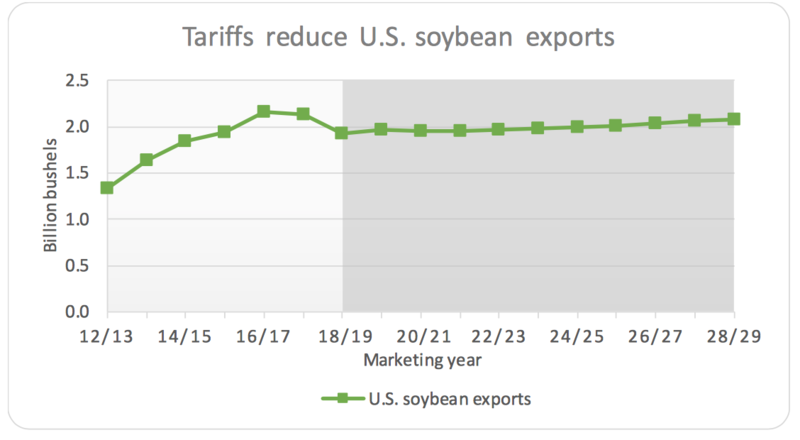 Because of a large 2018 crop and reduced exports, the soybean stock-to-use ratio increases sharply in 2018/19 and takes years to return to more normal levels. 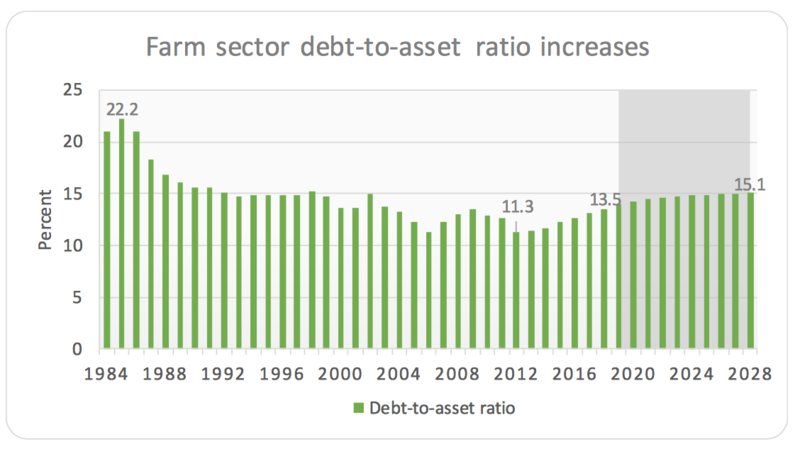 The FAPRI report also pointed out that, “The debt-to-asset ratio for the farm sector declined from 22.2 percent in 1985 at the peak of the farm crisis to 11.3 percent in 2012. 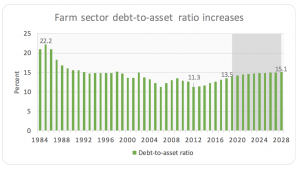 The ratio then increased steadily to 13.5 percent in 2018.